Media coverage and analysis of the three presidential debates in 2016, and of political discourse in general, focuses overwhelmingly on the answers given by politicians and public figures to questions such as this. Astonishingly little attention is paid to the questions themselves. Yet it is questions that fuel political discussion and debate, and determine, to a large extent, what is available for comment and analysis, and what is left unsaid. Questions play a vital, and often unnoticed, role in the political landscape. This is, perhaps, especially clear within the context of modern democracy where emphasis is placed on widespread and informed participation in democratic processes, such as voting, and the right to free speech and expression. These highly prized democratic ideals are, in several important respects, reliant upon the practice of asking and answering of questions. Take, for example, the question above. In the context in which it was asked, it serves at least three important functions that support and underwrite the democratic process. Firstly, it allowed the person asking it to take part in the debate. This is a simple but powerful function of questions. They allow anyone capable of asking them to participate in conversation, dialogue, discussion, and debate. And to do so in a way that invites others, including, in this case, the 2016 U.S. presidential candidates, to reflect upon and respond to whatever is being asked. The question gives its asker a role in the debate by allowing her to raise an issue about which she is, presumably, concerned, in a direct and collaborative manner. By asking a question, a person asserts their right to be a part of the discussion and to have their concerns taken into account. In this example, it ensured that the issue of Syria and the humanitarian crisis in Aleppo was featured in the debate. This is significant even when the answers given stray wildly from the intended topic. The question has nonetheless performed one of its key functions, acting as an entry point into discussion and debate, and as an invitation for others to enter into the very same discussion or debate. Participation in everyday political conversation, dialogue, discussion, and debate is often taken to be integral to a healthy democratic climate. Questions, quite literally, make such interactions possible by facilitating and guiding the exchanges that take place within them. If these interactions are indeed integral to a healthy democracy, then questions are playing a vital role. Secondly, asking questions is a familiar and effective way of getting information. This is, once again, a simple but powerful function of questions: it could indeed be viewed as their primary function. When we ask questions we are often, perhaps typically, trying to find things out. In doing so, we gather information about topics and issues that interest or concern us, whether it be out of pure curiosity, or for practical or political reasons. In the example above, the questioner targets specific information about Syria and Aleppo. In this way, she generates an opportunity for herself, and others, to gather information on this topic. The question, in this case, forces Hillary Clinton and Donald Trump to publicly express views on the situation in Aleppo, to address it as a humanitarian crisis, and to provide some indication of actions they would take, if elected, in response to that crisis. Of course, asking the question does not entail that any satisfactory answer will be given. Questions can be ignored, dismissed, or manipulated, as was the case with many of those posed during the 2016 presidential campaigns. Doing so, however, opens the respondents up to criticism in a way that is only possible if a question is asked in the first place. Had there been no question about Syria and the humanitarian crisis in Aleppo posed during the debate, it is far less likely that the presidential candidates would have addressed this directly, or been held to account for the answers given. Questions make information, about this or that thing, available for others to use, comment upon, and evaluate. Most strikingly, they determine which information is made available and which is not. This ability to target and expose the specific information one needs or wants, in a world increasingly overwhelmed by the proliferation and manipulation of information about everything under the sun, is another powerful feature of questions. If an informed public is integral to a healthy democracy, then questions are, again, playing a vital role. Thirdly, on the basis of the questions that are asked, and the answers that are given, people are not only able to inform themselves about the issues that matter to them, but also to make decisions about how to act. 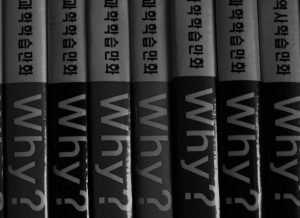 Questions facilitate informed decision-making. This is a final powerful function of questions. Again, it is illustrated by the question above. Based on the answers that Clinton and Trump provided, the questioner gains access to information that she wouldn’t otherwise have had about their views on, and solutions to, the humanitarian crisis in Aleppo. This information may not be in the form of a direct answer to the question but, even so, the topics covered, manner of the responses, issues left unaddressed, and so on, all serve to provide a valuable insight into the issue. This insight will almost certainly help to inform the questioner’s decision, at least to some degree, about which candidate to vote for. Not only this, but given the very public nature of the debate, by asking this question, the questioner has also opened up a window for the many millions of people watching the debate to gather information on the issue for themselves. Again, this will almost certainly, either consciously or sub-consciously, feed into the decision-making process for many of these people. In this way, questions play a valuable role in our communal endeavours. Questions make information, about this or that thing, available where it otherwise wouldn’t have been (if the information was already available, the question would, at least typically, not be asked). Insofar as the information is made in some way public, be that in a conversation in the pub, or on national television, it will frequently come to inform, in some small way, the decisions that we make about how to live, how to act, what to believe, who to trust, and how to vote. The opportunity to make informed decisions about these things, is, one might think, at the heart of a functioning democracy. If so, then the questions that we choose to ask, and the questions that go unasked, are indeed playing a fundamental role in our political landscape and our everyday lives.